In the churchyard of St Mary's church in the little Cumbrian village of Gosforth stands one of the real treasures of pre-Conquest England. 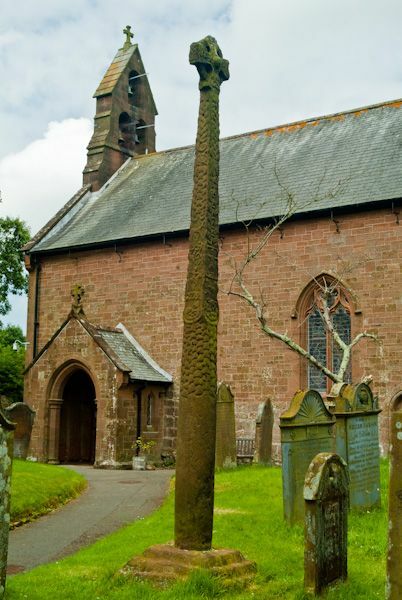 This is the so-called Gosforth Cross, a slender column of local red sandstone carved into a Scandinavian cross fully 14.5 feet high. 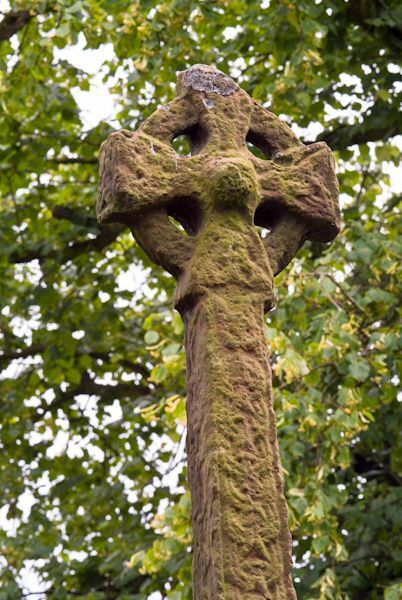 The cross was probably crafted in the late 10th or early 11th century, although some estimates place the date as far back as the 7th century. The shaft is peculiar in that it starts out round at the base and rises up to a square top surmounted by a small cross head. 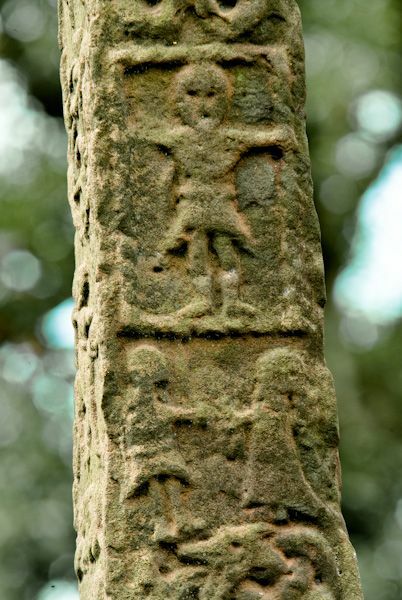 The cross is carved with a mixture of pagan and Christian images, leading most authorities to suggest that it was carved to show the triumph of Christianity over paganism. 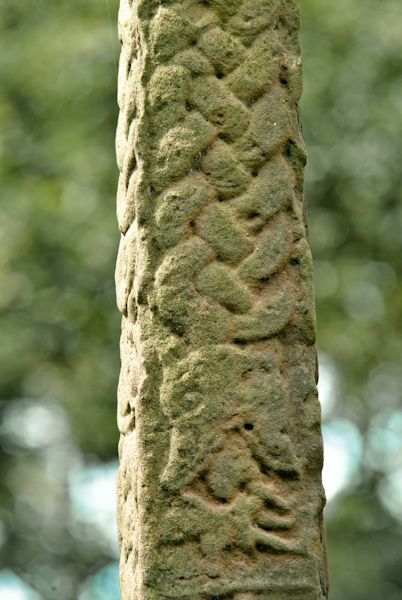 The cross is carved in a style called 'Gaut's interlace', a reference to Gaut's Cross on the Isle of Man. 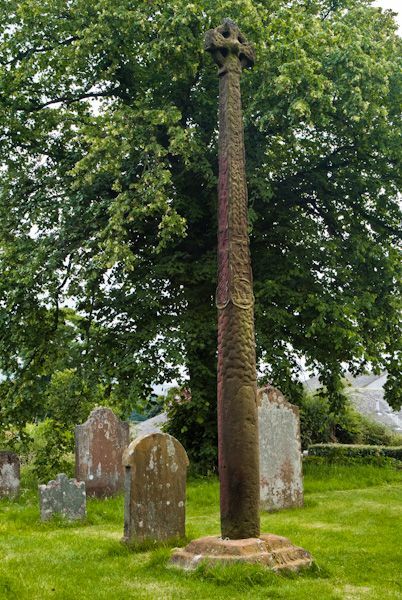 The lower section is carved with a Norse Tree of Life, with the branches of the tree creating a gorgeous interlaced pattern. 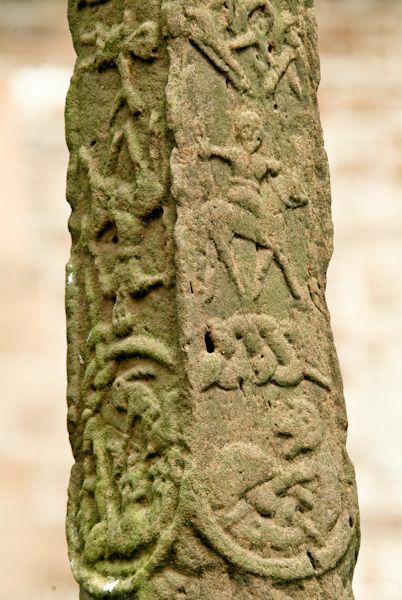 The upper section of the cross is more lively; depicting a variety of human and animal figures, including dragons, snakes, an upside down horseman, geometric designs, and a carving that may represent the bound figure of the Norse trickster Loki and his wife Sigyn (for more on Loki see our article on the Loki Stone in Kirby Stephen). 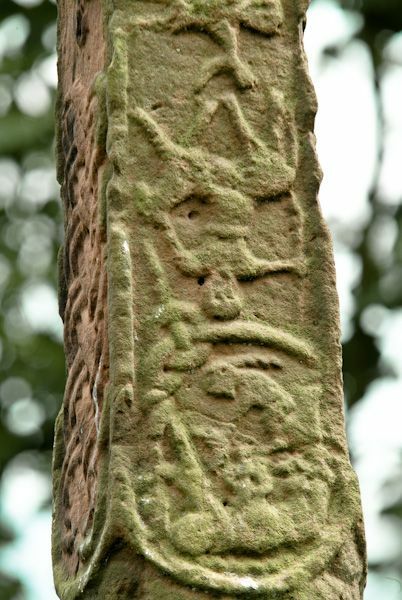 Other known or suspected Norse figures on the cross include the god Vidar tearing the jaws of the wolf Fenrir, Thor and the Midgard serpent, and the god Heimdallr with his horn. Only the east face of the cross has overtly Christian symbology. There you will see a figure of Christ standing with his arms spread wide, while below Christ are two figures which may represent Mary Magdalene and Longinus with his spear. Now, having said all that, one has to wonder when looking at the stone if the Christian symbolism has been interpreted as Christian just because that's what observers were looking for. Much of the carving looks so strongly Norse that I have to wonder if it was simply meant to represent a variety of traditional Viking themes and we are reading too much Christian influence into it? 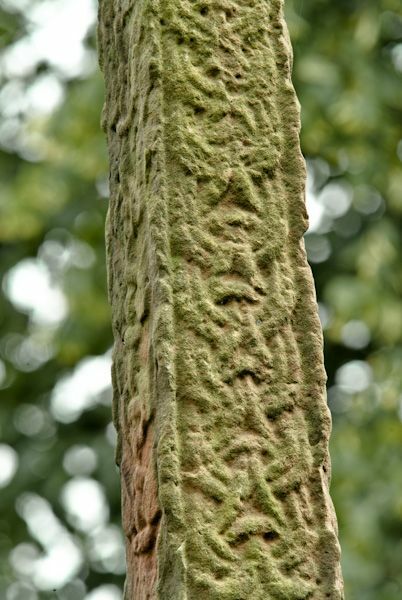 You might also be interested in our article on St Mary's Church at Gosforth (which also repeats some of the information about the cross). 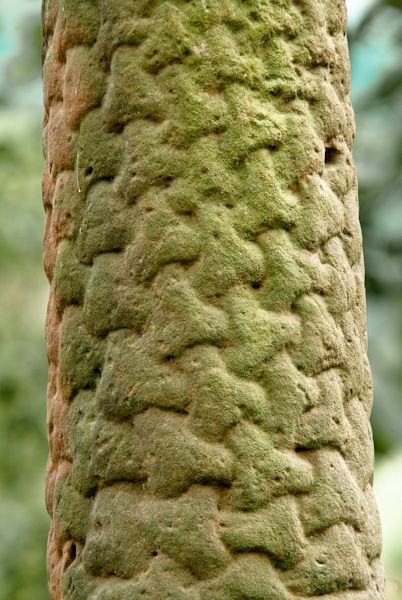 There are several interesting carvings within the church, including two hogback tombstones of a similar age to the Gosforth Cross. Location: The church stands in the centre of Gosforth, off the Wasdale Road. Free parking along nearby streets.